Elecare: Elecare Is A Nutritionally Complete Elemental Formula Specifically Indicated For Infants And Children Who Need An Amino Acid-Based Medical Food Or Who Cannot Tolerate Intact Or Hydrolyzed Protein. Elecare Is Indicated For The Dietary Management Of Protein Maldigestion, Malabsorption, Severe Food Allergies, Short-Bowel Syndrome, Eosinophilic Gi Disorders, Gi-Tract Impairment, Or Other Conditions In Which An Amino Acid-Based Diet Is Required. 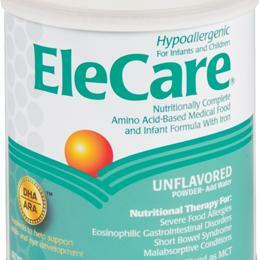 Elecare Unflavored Product Is For Both Infants And Children. For Oral Or Tube Feeding, Not For Parenteral Use. Features: Clinically Documented To Be Hypoallergenic, Virtually Eliminating The Potential For An Allergic Reaction; Clinically Shown To Support Growth When Used As A Primary Source Of Nutrition; 100% Free Amino Acids As Nitrogen Source; One-Third Of Fat As Medium-Chain Triglycerides, An Easily Digested And Well-Absorbed Fat Source; Stringent Manufacturing Standards To Reduce Risk Of Whole Protein Contamination; Does Not Contain Milk Protein, Soy Protein, Fructose, Galactose,Lactose, Or Gluten Unflavored; Powder: 14.1-Oz (400-G) Cans (Measuring Scoop Enclosed).